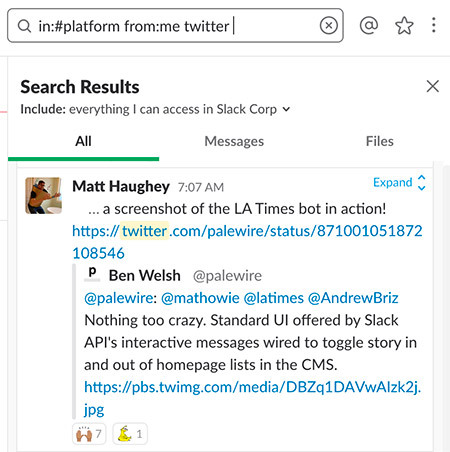 Slack is built to help people collaborate at work in a variety of ways — but at its core are channels. They’re how Slack organizes conversations and they help tie everything together. Over the coming months, we’ll take deep dives into all the ways channels work; but we wanted to start by talking about what channels are and how they can transform your work, while keeping things organized. You work on a lot of different projects at once, and it’s not easy to keep track, especially when lots of other people are involved. Creating a new channel in your Slack workspace is the first step in bringing order to the chaos. Channels let you organize conversations in the ways that make the most sense for your team. Create channels for every function, project, or by subject matter, so everyone has a space to discuss their work. Working in Slack means everything is archived and saved, all organized by channel. While channels have members who can come and go as needed, you can search messages and files posted inside channels, including those you’re not part of. You can scroll back and read, or search for specific context, insights, and data you need to get your work done, across the company. Say you want to find mockups from a project completed last year. Where do you even begin to look? 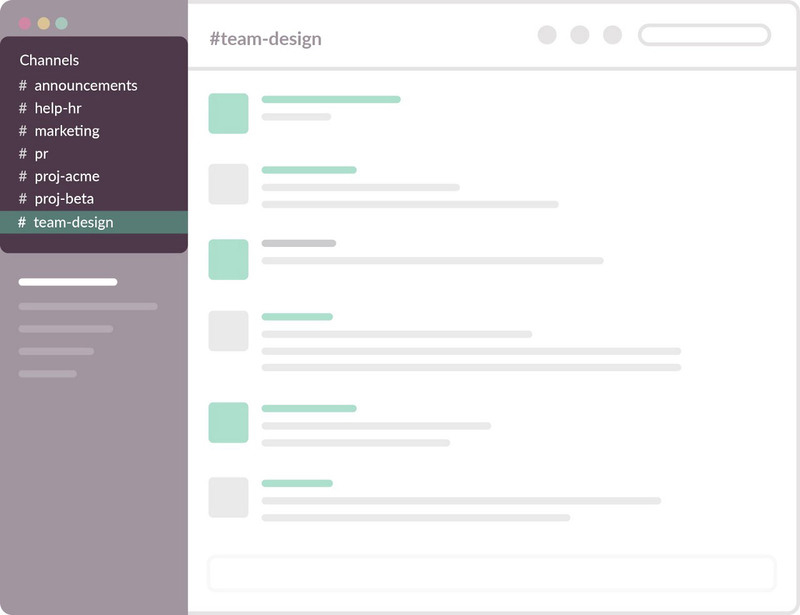 In a well-organized Slack team, you can check for any existing project channel (maybe it’s #project-xanadu ) or ask the right people in #team-design and boom, you can dig up exactly what you needed. At a busy company, it can be hard to track whether you’re looping in the right people at the right time. If they weren’t included in previous conversations, getting them up to speed is key. Channels make it easy to include new people at any point in a project, as channels can exist before someone arrives and exist after they leave. Invite them to a channel, and they can read the full history by scrolling up. It beats the old days where new team members started with an empty inbox and slowly caught up as messages arrived with new information. It’s worth noting that public channels are transparent to everyone within a Slack workspace. Work and information that before have been stowed away in disjointed email threads and direct messages are now accessible to anyone reading those channels. When every member of the team can learn from and contribute towards common goals, it leads to a more inclusive way of working and communicating. At work, you likely have to juggle a dozen or more online tools. You’re constantly switching context and it’s hard to share information from one service to another, especially in a way that’s relevant and actionable. Channels let you bring the tools and services you use, like Salesforce, JIRA, and Google Drive, right into the conversations you’re having with your teammates. You don’t have to switch gears; you can share files and tickets easily, and all of the context is there. With so many projects and people competing for your time and attention, it can be hard to stay on task; you know you should prioritize, but you don’t want to miss out on anything important. Channels in Slack can help you focus, so you don’t have to keep track of absolutely everything going on around you. Star and read the channels that are most important to you. Set custom notifications to ping you only when your core team and project channels post new messages. For channels you might only need to review once in a blue moon? You can mute them and they’ll fade from view. You can also leave channels when they’re no longer relevant for you, or archive channels when the work within them is completed. A well-organized Slack workspace is a beautiful thing. And channels aren’t just confined to your organization. With shared channels, your team can work with outside collaborators, colleagues, and even entire agencies by sharing channels between organizations. Modern teams need to be ready for anything, and channels help move everyone in the same direction quickly. They give everyone context for what’s happening across an organization, and help create a shared sense of purpose and belonging. Channels are the future of work, and it’s why channels are the heart of Slack.